We know that fall is here when the weather starts getting cooler, the leaves start turning colors, and there is football on the TV all day Sunday. My husband and I enjoy watching football games but even more than watching the games we enjoy our football day snacks. It’s fun to lounge around on a Sunday either by ourselves or with friends and enjoy “homegating” with some snacks, conversation, and a few rivalries. Since it’s still warm enough to be outside we always make sure to grill something in addition to the traditional snacks. When we have people over we have a mixture of meats and veggie cuisine. 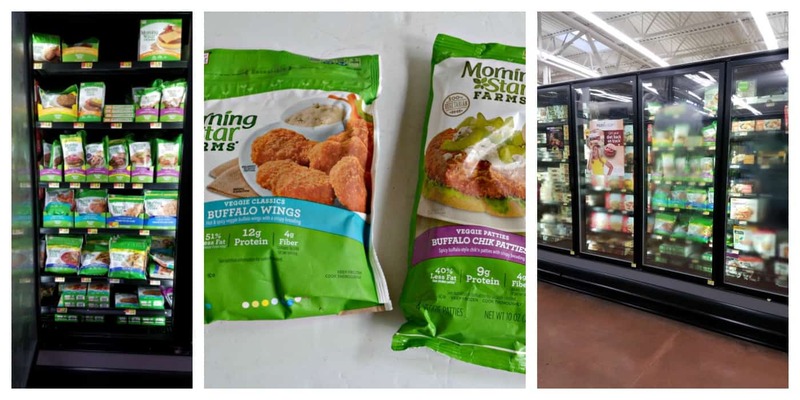 I’m loving all of the delicious options available from MorningStar Farms® at my local Walmart store. 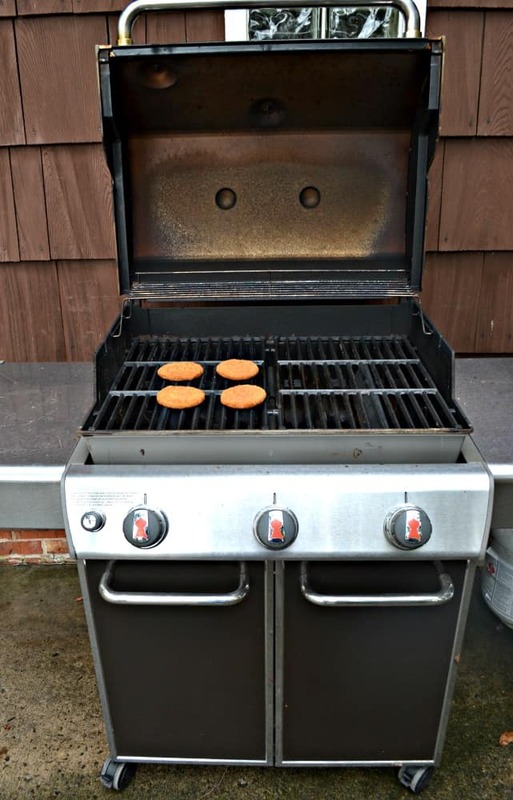 While I always love MorningStar Farms® Spicy Black Bean Burgers, for Game Time we decided to grill up MorningStar Farms® Buffalo Chik Patties®. They have great flavor and everyone likes them, not just the vegetarians in our group! Check out this rebate valid on MorningStar Farms® Frozen Veggie. Buy 3 for any variety, any size. As for snacks, I’m always up for trying something new. 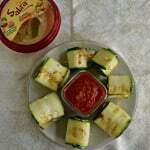 We like to serve a variety of dips with chips but I like to have food that’s a little heartier as well. I recently discovered MorningStar Farms® Buffalo Wings and while they are great served with ranch or blue cheese I wanted to use them in a recipe this time around. I decided to make Vegetarian Buffalo Wing Pinwheels. Pinwheels are something that I’ve been making forever. They are so easy and people seem to love all variations of them. All you need is some sort of cheese, some type of spread or dressing, the main filling, and maybe a veggie or two. They take minutes to make and they are always gone quickly at our homegating parties! For these pinwheels I used MorningStar Farms® Buffalo Wings, light blue cheese dressing, green onions, red peppers, and just a touch of cheddar cheese. I spread the blue cheese dressing on a tortilla then fill it with the other ingredients. 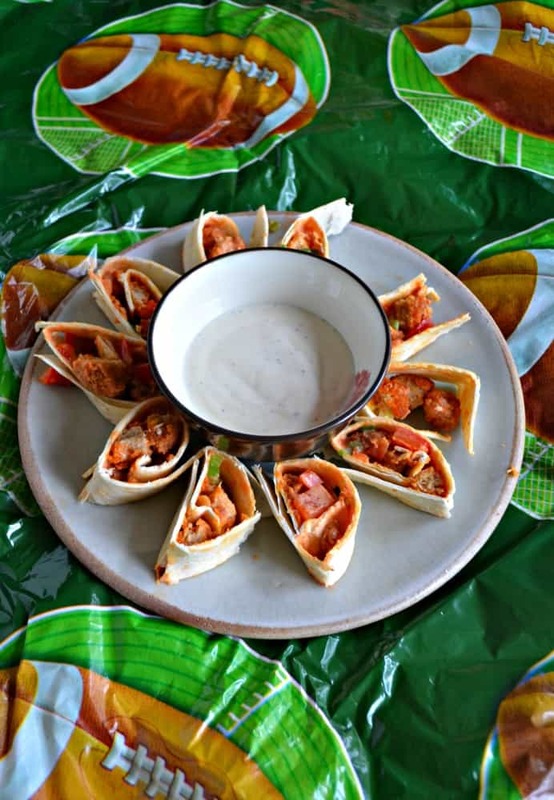 Simply roll up the tortilla, slice it into pieces, and I had delicious Vegetarian Buffalo Wing Pinwheels! Of course every pinwheel needs a dip so I made my homemade Ranch dressing to go along with it but you can certainly use bottled dressing to make it even easier. I spread the pinwheels out on a platter with the dressing in the middle and put them on our football food table for snacking during the games. They were a huge hit and I’m sure I’ll be making them again soon! 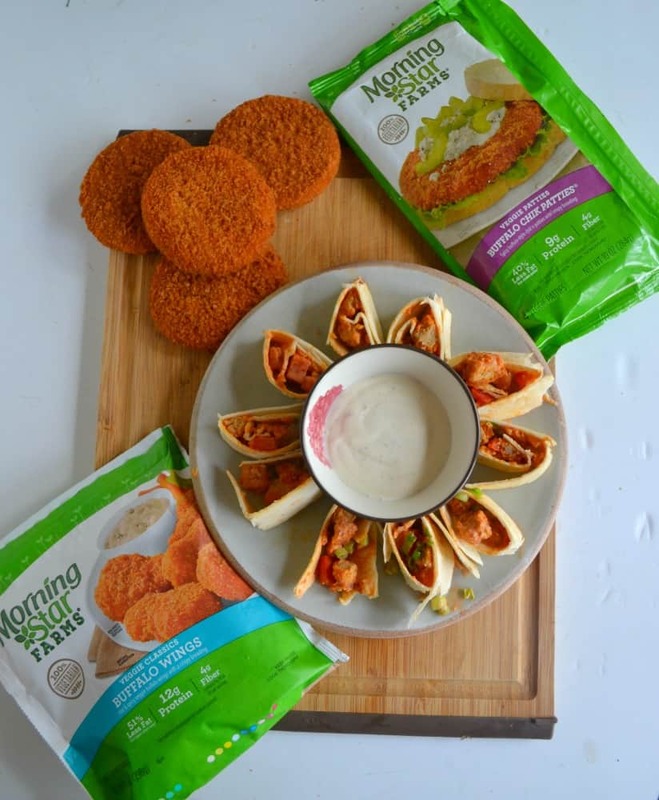 A delicious vegetarian Game Time snack made with MorningStar Farms® Buffalo Wings! Heat the Buffalo Wings according to the package directions. Cut each one into 8 pieces and put aside. In a medium bowl combine the buffalo sauce, green onions, red pepper, and blue cheese. Mix well. Spread the soft tortillas out on a flat surface. Spread ¼ of the buffalo sauce mixture over top of the tortilla. Sprinkle with half of the Buffalo Wing pieces. 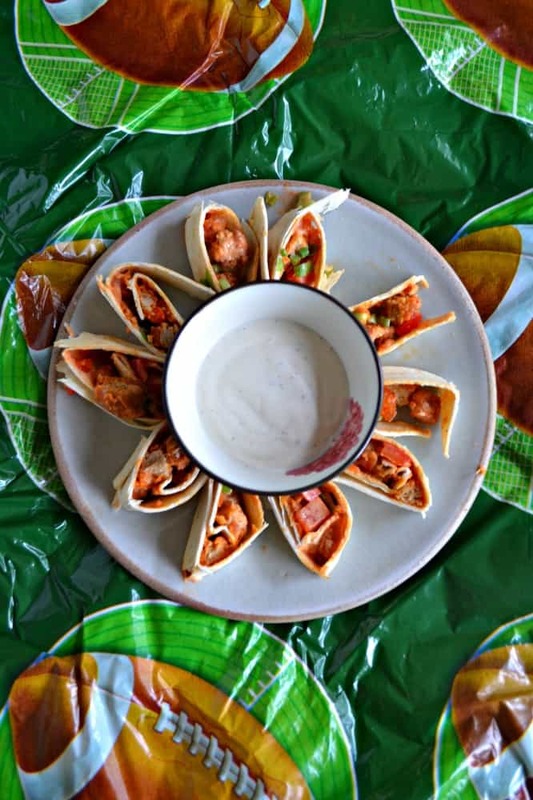 Roll the tortillas up and slice each one into 8 pieces. Place on a plate and serve with Ranch dressing. Want more great recipes using MorningStar Farms? Check out the MorningStar Farms social hub where you can find great recipe inspiration! Oh, I bet these are delicious! Perfect for tailgating season. Thanks for sharing!